Star Trek.com--official Paramount Star Trek web site. Star Trek.com Library by Paramount. A History of Ships Named Enterprise by David Wells (at the Star Trek Archive)--history of Earth and Federation naval and space vessels named Enterprise. Klingon Language Institute--non-profit organization dedicated to study of the Klingon language. 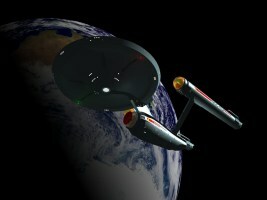 Star Trek Archive by D. Joseph Creighton--includes lists of ships and stars/planets/locations. Star Trek Cartography by Christian Ruehl (English version)--analysis and conjectural model for Star Trek galactic geography. Stardates in Star Trek FAQ by Andrew Main (at the Star Trek Archive)--analysis and conjectural model for stardates. Subspace Physics by Jason W. Hinson--conjectural theory for subspace physics. Vulcan Language Institute (archived copy at Star Trek online Geekipedia. Star Trek and related material are copyrighted by Paramount Pictures Corporation. References to said material at this site are for non-commercial, not-for-profit use. Copyright © 2001-2008, 2009 by Wm. Robert Johnston. All rights reserved. Last modified 22 December 2009.